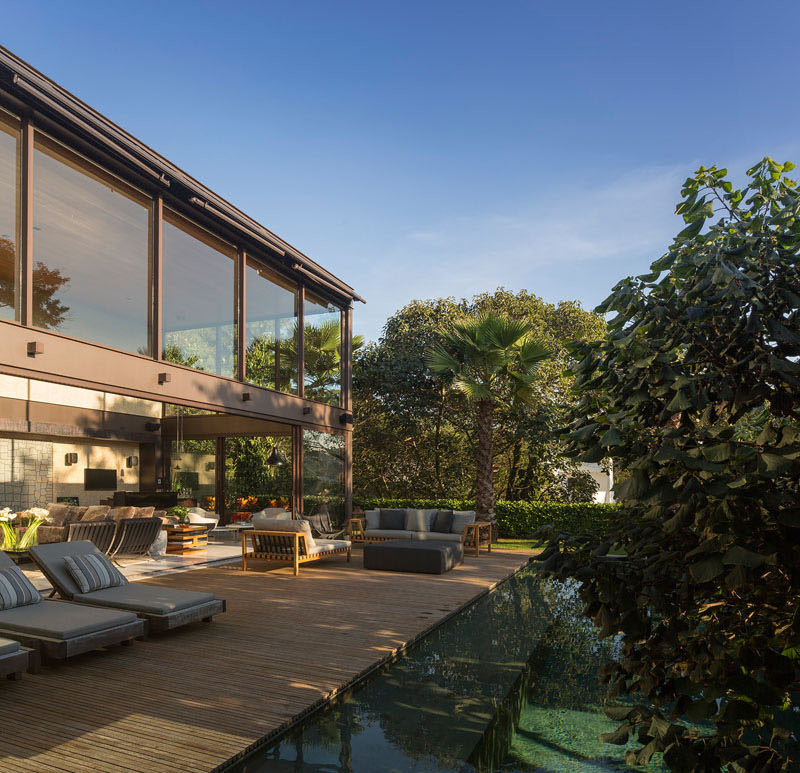 A modern home surrounded with glass windows and walls making it airy, bright and transparent. Of course, we want our homes to be private because our homes are our sanctuary and a place where we are free to do whatever we want that is away from the public eye. But have you heard of transparent homes? 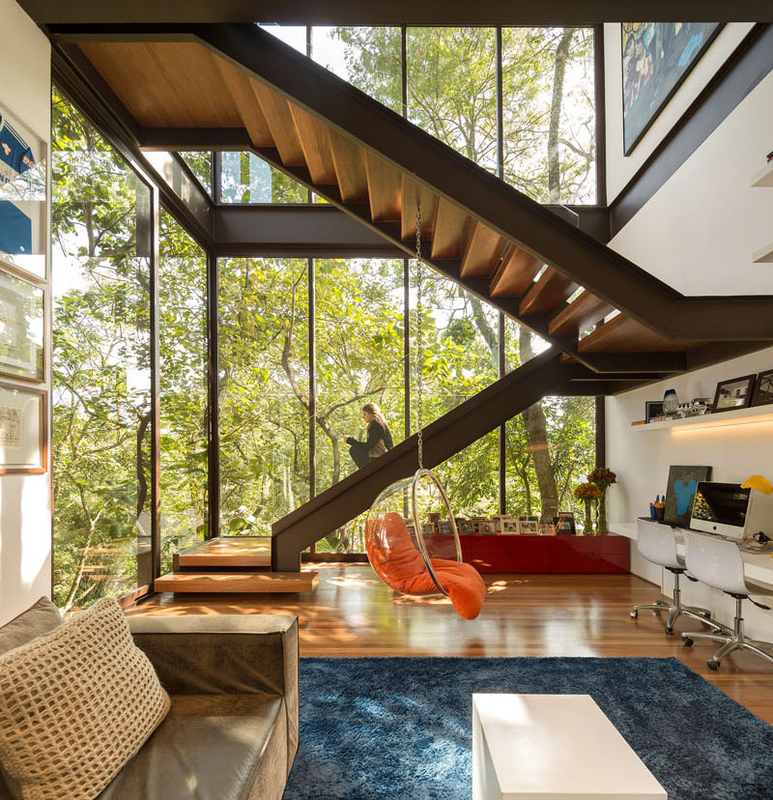 Yes, there is such thing as homes that are surrounded with glass. These residences may appear transparent but privacy can actually be observed in many different ways. Others add louvers to it while still others add tall drapes or shades so that they can cover the area when needed. 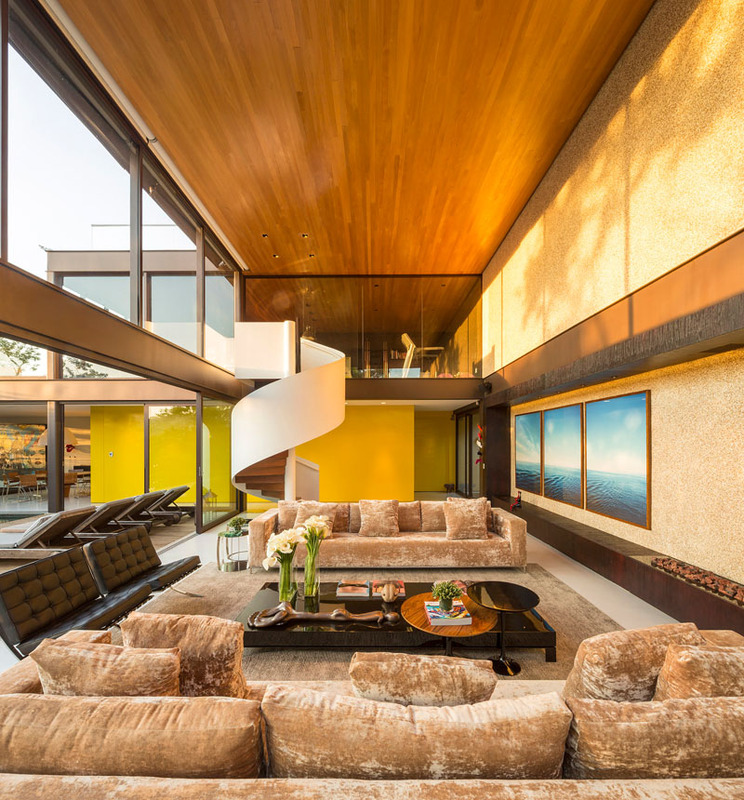 Today, we are going to show you a house that has tall walls of glass windows around it. 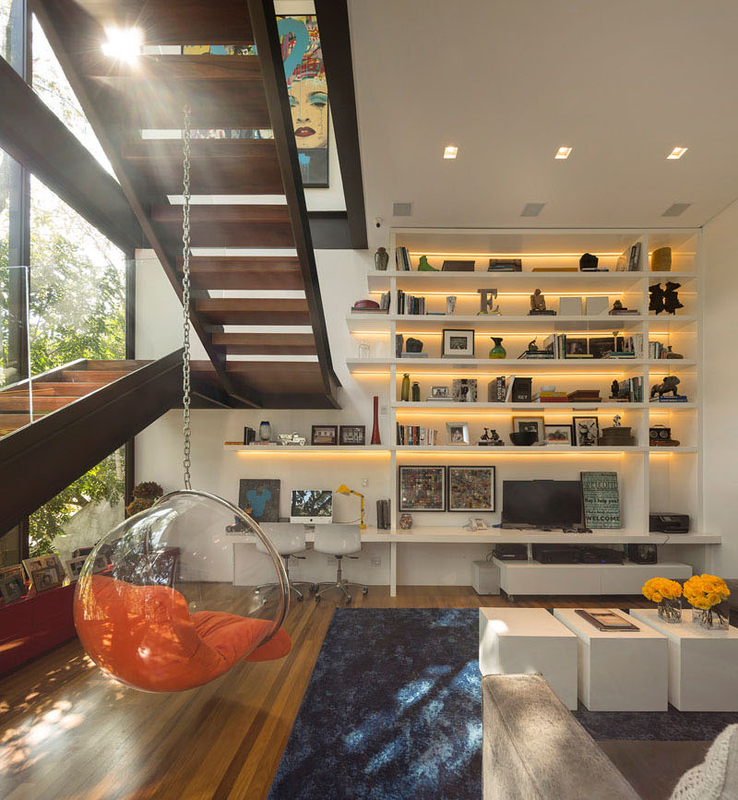 Limantos home is located on a steep site in Sao Paulo, Brazil. It combines simple geometry and extensive use of glass in order to create dramatic spaces for living. This home is designed by Fernanda Marques Arquitetos Associados which features a swimming pool with a large outdoor deck. From the outdoor area, it has direct access to the interior living area that is perfect for entertaining. The design of the house used simple and harmonious lines to come up with a modern architectural home. Steel frame and concrete was also used in the structure with glazed facades for transparency. According to the designers, the project evokes the rationalist architecture of Mies van der Rohe. It measures 820m², over 3 floors and it contains 13 different rooms. The project is completely open to the surrounding greenery and it offers spectacular views while providing privacy to the home. So, practically outlined only by glazed panels, the house seems immersed in the landscape. The interior design project aims at intimacy and uses indirect lighting, as well as warm coverings, such as wood. Unique feature: The home has a modern design featuring a lovely outdoor pool while the house is surrounded with walls of glass windows that made it appear transparent. The outdoor area of the house is totally pleasing as it feature a pool area that is well landscaped. You can also see here that the house has frosted glass partial wall that was added to the area in order to allow the light to come through from the bedroom window. At the same time, it also provides privacy and appeal to the space. There is a wooden deck for the house where outdoor furniture is added. This way, the owners has a place for relaxation and they will also be given the chance to enjoy the beauty of nature around it. This house is indeed blessed with a beautiful outdoor space. But its interior is also nice as well. The sleeping quarters are preserved from view, which contain a playroom and 3 bedrooms, all with en-suite bathrooms. A spacious hall provides access to the master bedroom that has a his and hers bathroom and a dressing room. 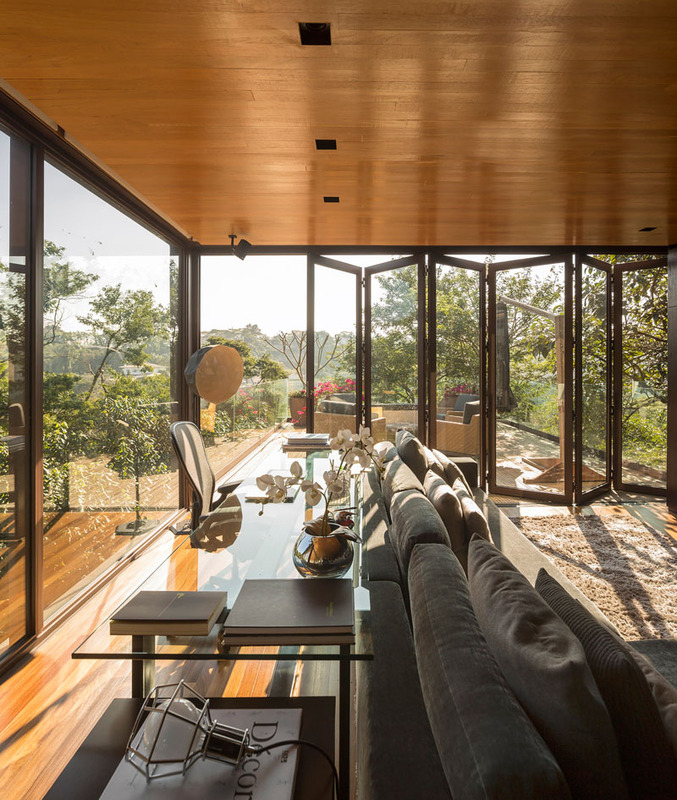 In the interior, the living area has a double-height wood ceiling and it is surrounded by windows and sliding glass doors that would give a good view of the outdoor area. Good thing that they have a beautiful garden in it. Also the house has beautiful furniture and decors as well. There are multiple sitting areas in the house both inside and out. Even if an eclectic mix of furniture is used here, it still turned out really beautiful. At night, the living area can be closed off from the swimming pool and lovely lights are turned on. You can get a closer look at the living room’s furniture in this image. Notice that it used a black glass coffee table to compliment with the space. 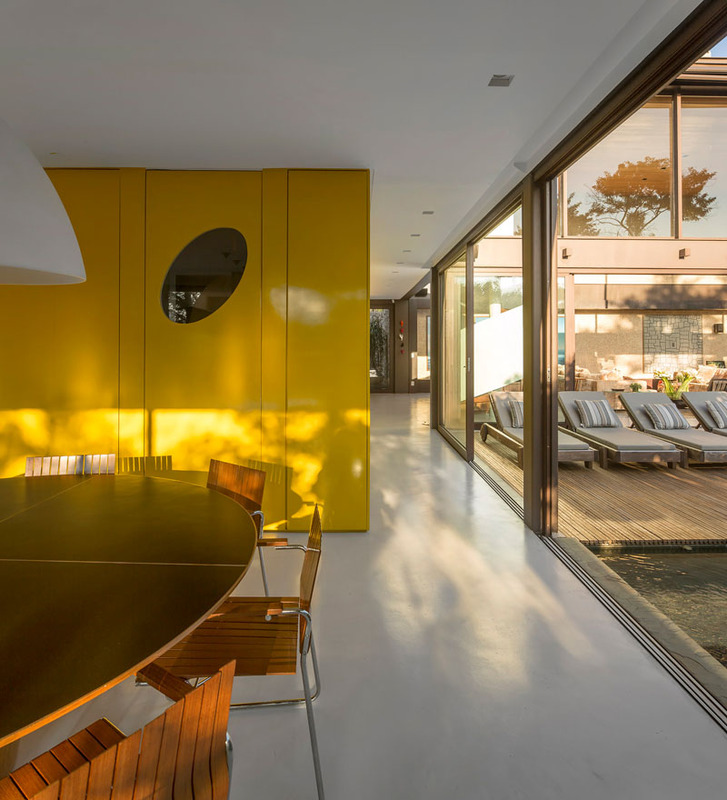 Opposite the wall of glass on one end of the room is a bright yellow feature wall which is located behind a spiral staircase. Yes, it is indeed unexpected to find a yellow wall accent in a space like this. In the double-height living room, one can see a helical staircase with structural features that provides access to a mezzanine. In the mezzanine, it is where the media room, fitness room and a terrace with a fireplace are seen. The white and wood spiral staircase leads to the second floor of the home. The yellow feature wall isn’t there for mere aesthetics purposes because it hides the guest bathroom, kitchen, pantry and service stairs. You can also see here the dining room with glazed doors open up to the garden. There is also another set of stairs next to a small lounge room with a shelving unit that has hidden lighting. 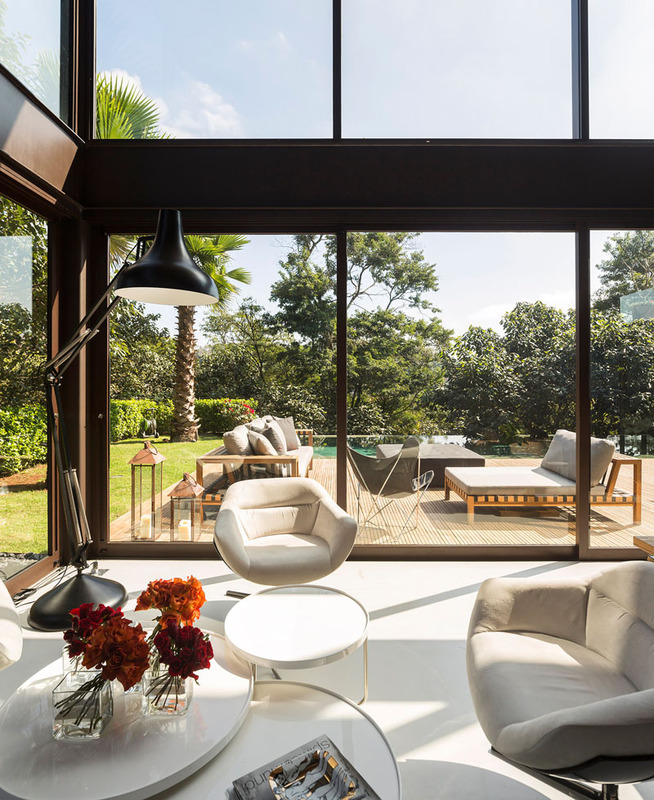 Large floor-to-ceiling windows fill the space with natural light. You can also see that this one has a transparent swing chair with orange pads. Upstairs, one can see how the wood ceiling from the main living area flows through to the upper areas of the home. You can also see here the billiard table where the owners can have a fun time with family and friends. There is also a small outdoor space just off the upstairs games area. It also has its own living room with a view of the pool below. Also seen here is working area with a glass desk. 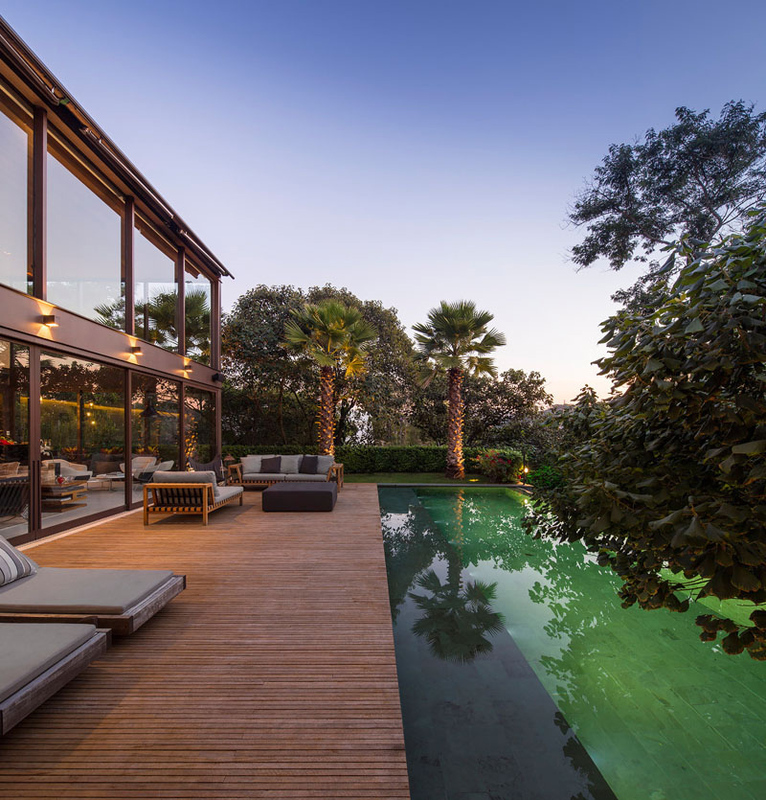 The living room is also connected to the dining room by a glazed partition where a deck, an infinite pool and a side garden is integrated. Well, if you are not a fan of transparent homes, you will surely look at them differently now after you saw this house. It does look really nice when natural light could flood inside your home and you could get a good glimpse of the outdoor area while inside. 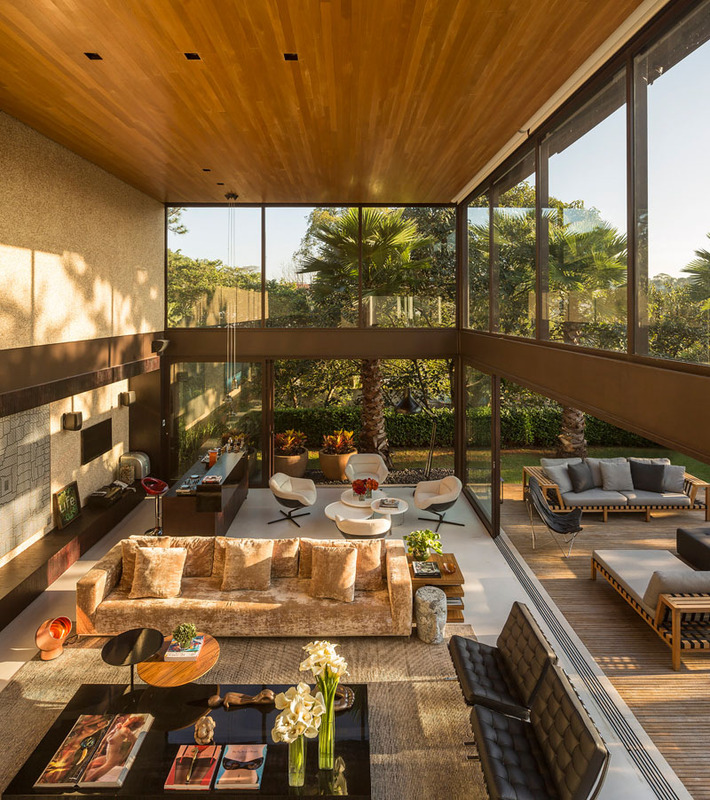 This project is a creative design by Fernanda Marques Arquitetos Associados who made sure that they are able to give the homeowners the kind of residence that they want. Also, this could be a lovely inspiration for those who would like to use glass around their house. How about you , what can you say about this home?